The cruel child King of the Seven Kingdoms is getting an all-new figure from ThreeZero. 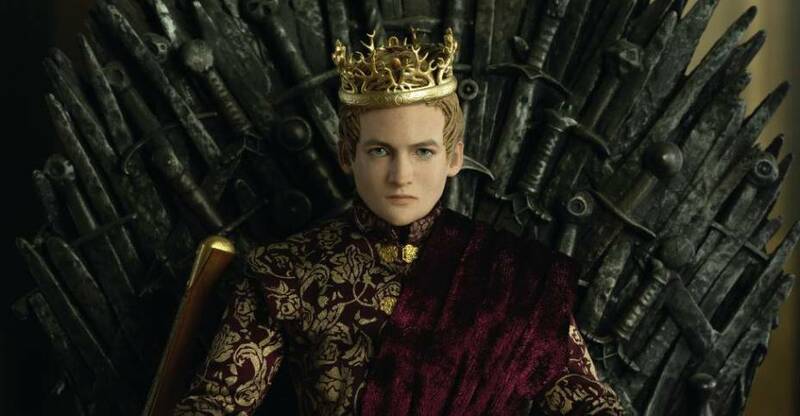 They have have released a preview photo for their new Game of Thrones – Joffrey Baratheon 1/6 Scale Figure. Portrayed in, what I believe to be his Season 4 attire, King Joffrey is set to include a crown and a cloak. Additional accessories will likely be included. Look for more photos and details to be released soon. You can see the full preview photos after the jump. Today we are taking a look at the Anime re-color of the ThreeZero 1/6th scale Ultraman figure. This is based on the new anime that just hit Netflix dubbed in the west, bringing Ultraman lore into the modern age. It features lights in the arms, chest and eyes and metallic paint head to toe. Articulation is thorough at all key points allowing for almost any pose. I wasn’t huge into Ultraman before the new series, but I’m all in now and this figure really captures the show well. If you aren’t familiar, just imagine: Japanese Iron Man – and you’ll be in the right zone. While the anime wasn’t perfect, the overall story was awesome and there is a lot of eye candy in there if you dig mecha suits and action. This ThreeZero figure is the perfect centerpiece if you do. Read on to check out some shots showing what it can do, he’s due to drop in 2nd Quarter 2019! 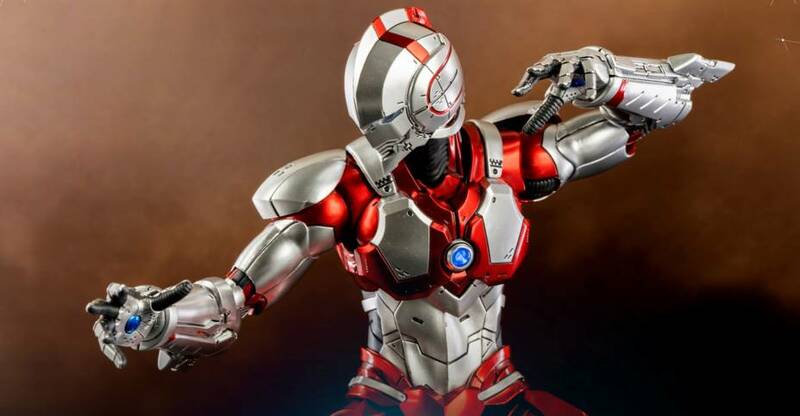 ThreeZero has released photos and info for the a new version of their Ultraman 1/6 Scale Figure. The original figure, revealed back in 2017, was based on the modern manga series. This repainted figure is based on the new anime. The figure stands 12″ tall, with a mix of metal and plastic pieces. The figure will include light up LED features in the head, chest and arms. Accessories include interchangeable hands, and Specium Blade effect parts. The figure is priced at $129, with free worldwide shipping included. Pre-orders will open up on March 15th at 9:00 Hong Kong Time. Check out additional info and the new photos after the jump. After an initial preview yesterday, ThreeZero has released photos and full details for their upcoming Game of Thrones – 1/6 Scale Drogon. For this collectible, ThreeZero has opted to release Drogon as a polyresin statue with a diorama base, as opposed to a fully articulated figure. The statue includes a themed base, featuring the skeletal remains of some victims. It will stand nearly 18″ tall, and almost 23″ head-to-tail. Drogon will be priced at $1,499 when pre-orders go live this Friday. Check out some additional info below, and see the photos by clicking the headline of the story. This holiday season, threezero will offer a very special release for our officially licensed Game of Thrones series of collectible figures. 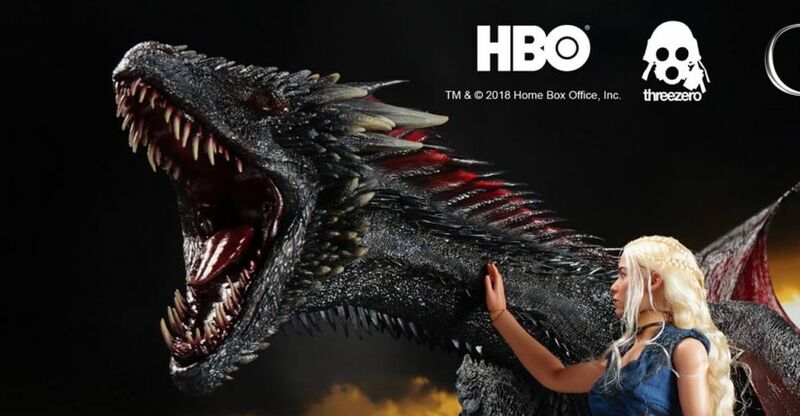 Pre-orders for the 1/6 scale Drogon collectible figure will begin on Dec 21 at 9:00am HKT at https:// www.threezerohk.com/; priced at $1499 USD / 11499 HKD /9998 RMB with worldwide shipping included. Previews is offering an exclusive variant of the upcoming Fallout 4 – X-01 Power Armor 1/6 Scale Figure. This is the second variant, as the Bethesda Store is also offering their own exclusive version. For this release by ThreeZero, the X-01 Power Armor Quantum Variant has a very bright blue and purple paint deco on the armor. The figure has all the accessories and swap out parts that are included with the original and Bethesda exclusive releases. 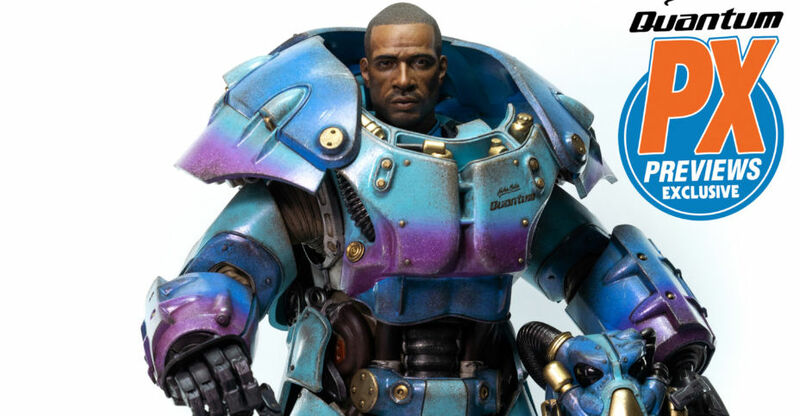 Those include interchangeable helmeted and unhelemeted portraits, LED light up functions, swappable armor pieces with the upcoming FO4 Armor, and the Assaultron Blade. The figure is priced at $380 with a release set February 2019. Official details and the first photo can be seen after the jump. 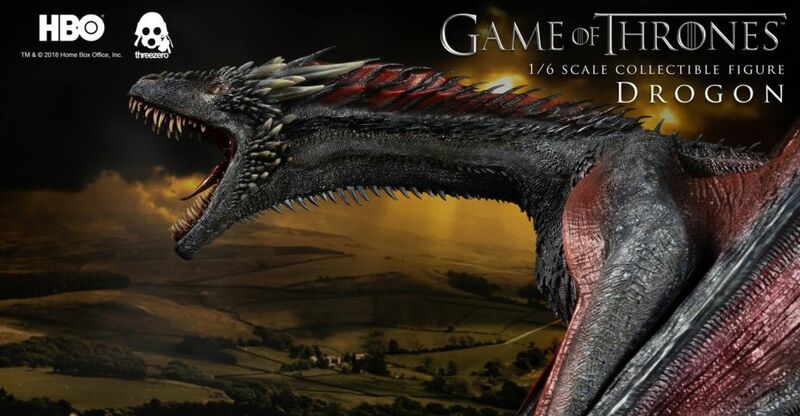 ThreeZero has shared an official preview photo for their upcoming Game of Thrones – Drogon 1/6 Scale Figure. The massive dragon was originally shown off at Shanghai Comic-Con 2018 back in October. Drogon is one of three dragons that were hand raised by Daenerys Targaryen in the hit HBO series. This release will portray the nearly adult dragon, complete with diorama base featuring the scattered bones of his unfortunate victims. Pricing and a release date for Drogon have not been released at this time. We will update with further photos and details once they become available. For now, click the banner image for the full photo. 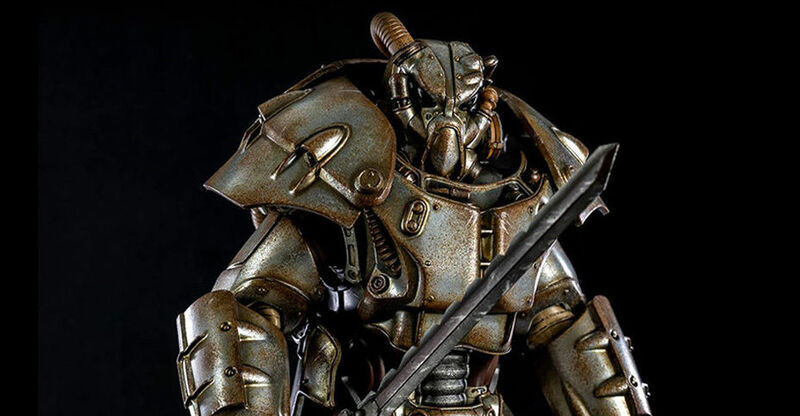 The Bethesda Store has opened up pre-orders for a variant of the Fallout 4 – X-01 Power Armor 1/6 Scale Figure. 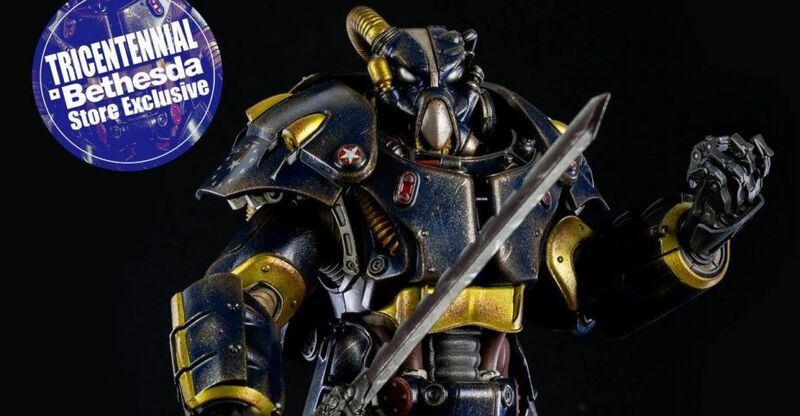 The X-01 “Tricentennial” Power Armor Figure is a Bethesda Store Exclusive. Other than the new colors, the figure has all the accessories and swap out parts that are included with the standard release. 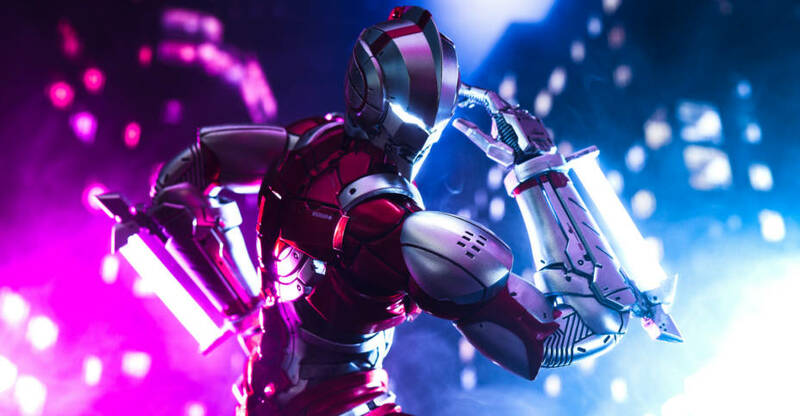 Those include interchangeable helmeted and unhelemeted portraits, LED light up functions, swappable armor pieces with the upcoming FO4 Armor, and the Assaultron Blade. The figure is priced at $400 with a release set April 2019. Pre-order links, details and new photos can be seen after the jump. ThreeZero has shared full details and plenty of new photos for their upcoming Fallout 4 – X-01 Power Armor 1/6 Scale Figure. The figure stands over 14.5″ tall with about 35 points of articulation, including fully articulated fingers. The X-01 includes swap out helmeted and unhelemeted portraits, LED light up functions, swappable armor pieces with the upcoming FO4 Armor, and the Assaultron Blade. Pre-orders go live on December 11th at 9:00AM Hong Kong Time. It will be priced at $398 USD with free worldwide shipping included. See more details below, and click the headline of the story for the photos. 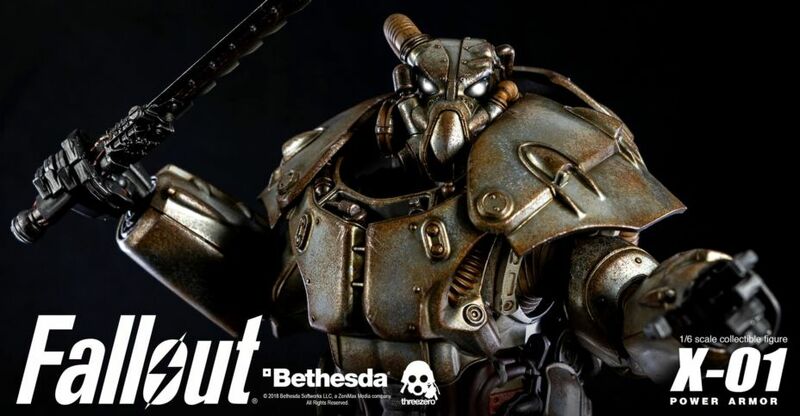 threezero and Bethesda’s FALLOUT 1/6 X-01 Power Armor will be available for pre-order at https:// www.threezerohk.com/ on December 11th 9:00AM HKT; priced at 398 USD / 3096 HKD with worldwide shipping included. The X-01 Power Armor collectible figure stands 14.5” (36.8 cm) tall and features over 35 points of articulation. This Power Armor includes a new highly-detailed male head, exchangeable X-01 helmet with a light-up LED function, and Assaultron Blade. Like all previous threezero FALLOUT figures, all X-01 outer-armor pieces are detachable and interchangeable with all previous threezero Fallout Power Armor collectible figures. Under the detachable outer-armor, you will find an endoskeleton with amazing attention to detail. * Includes highly detailed Assaultron Blade weapon. Materials used: ABS, PVC, POM, Magnet, Fabric. Requires: AG13 X 2 Button Cell Batteries for light-up LED function (Batteries Not Included). ThreeZero has released a new preview photo, showcasing their next Fallout 4 figure. Their next release will be the X-01 Power Armor 1/6 Scale Figure. The figure is shown with an Assaultron blade. We’ll update with more photos and details when they are released. Click the banner image for the full size preview. ThreeZero has released official images and info for their upcoming The Walking Dead – Carl Grimes 1/6 Scale Figure. The figure is based on his appearance in Season 7 and Season 8 of The Walking Dead TV Series. 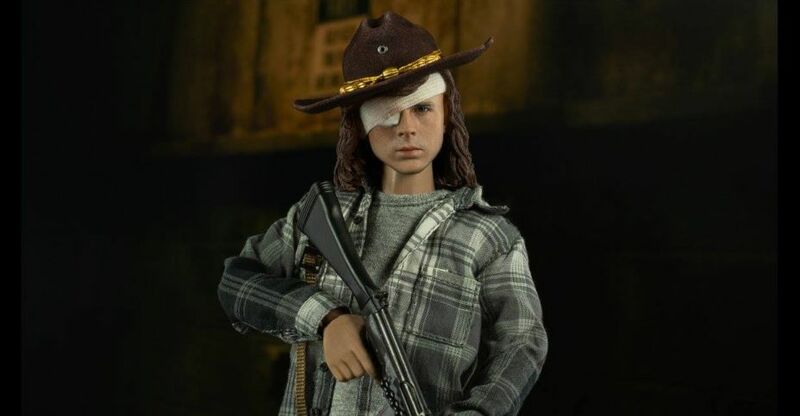 Carl includes multiple interchangeable hands, a removable eye bandage, a removable hat, a pistol with holster, an assault rifle, and a knife with sheath. A deluxe version will be available as well, which includes a blood covered poncho and an additional shirt. Pre-orders for the figure will go live on Wednesday, November 7th at 9:00 AM Hon Kong time (about 8:30 PM EST tonight). The standard version will be priced at $168, while the ThreeZero Exclusive Deluxe Version will be priced at $188. Free worldwide shipping is included with either purchase. See the photos and additional details after the jump.